When you take a photograph, you don’t necessarily have to capture everything correctly the first time. From amateurs to professional photographers, plenty of technology exists that can make a photo more surreal and fantastical. The Annenberg Space for Photography’s current exhibition, Digital Darkroom, explores the ways in which photographers utilize technology to create their pieces. From humorous to dramatic to visionary pieces, the works of the 17 artists are far from ordinary. Digital Darkroom is not only a showcase of some of the best artists playing with the best technology, it’s also an in-depth exploration into a relevant question: Have technological advances in photo manipulation, such as Photoshop, changed fine art and photography for better or for worse? Even if visitors don’t have a strong tie to either side, the exhibit compiles enough intriguing photography to keep any visitor’s curiosity piqued. Visitors armed with a map and 3-D glasses are left to roam the first few pieces and also sit down to watch a video. The short video introduces the artists in the show and the technology they use. One by one, the artists let viewers in on their artistic machinations. Viewers hear what inspires these artists and watch them in action behind a computer as they click away to create their edited works. Yet despite the fact that they all share the commonality of sitting behind a screen to create their works, the artists of Digital Darkroom are stylistically diverse. The jokester of the group is Pierre Beteille, an artist who confesses he isn’t a good photographer and doesn’t like to explain the meanings of his works. Beteille takes simple photographs of himself in his home and then uses his computer to insert a nugget of comedy here and there. 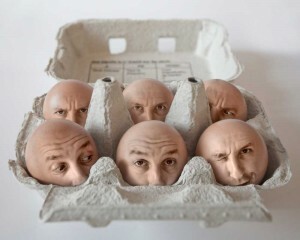 His piece “Me, me, me, me, me … and me!” is a photograph of his face in different expressions set up as eggs in a carton. It’s not a complicated idea but it’s immediately amusing. In another photograph titled “Waiting For Holidays #3,” Beteille is seen in front of an ocean holding what seems to be a surfboard but upon a closer look is actually an ironing board. Martine Roch’s pieces are also humorous but less overtly silly. The artist places animal heads onto human bodies, similar to those strange dogs with human hands that appeared on Sesame Street, which were inspired by William Wegman’s photographs. Roch, however, doesn’t only use dogs and tries to capture the expressions in her chosen animals’ eyes and match that emotion to a human body. The resulting photographs are funny but crafty. The artist expertly pairs animal and human bodies in pieces such as “The Delicate Lady,” a photograph of a rabbit in a dress. The dress makes sense with the face and the body of the animal; the animal’s face and neck mesh seamlessly with the rest of the body. Somehow these animal-human hybrids seem to fit right into reality. In fact, many of the artists’ works either attempted to redefine reality or create something completely different. Brooke Shaden’s works are her attempt to recreate different scenes from her imagination. Shaden is the youngest in the group but her talent is evident; the subdued colors and eerie settings of the pieces evoke the mental image of a disturbed fairyland. “Sleepwalker” shows a woman from the top, her hair loose and her hands grasping her face. The photograph is especially stunning because of its emotional content but also because it could be perceived as either a photograph or a painting; the colors, texture and background make the work both dark and alluring. The 3-D section of the exhibition also presents a range of aesthetic inspirations. Fittingly, the 3-D video picks the brains of the artist and explores the history of 3-D photography. Mike Pucher’s photos of flowers beautifully magnify the delicacy of his chosen subjects while Christopher Schneberger’s historically inspired, creepy works shed light on old tales. Schneberger’s photos illuminate how 3-D technology could also help portray the supernatural -— save for a few, his photographs are effectively captivating and chilling, and at times the scenes seem almost real. Overall, the 3-D and non-3-D showcases mix well because they explore how much a photograph, even when tweaked with technology, can approximate reality. In this aspect, Digital Darkroom leaves it up to the viewer to answer the question of where photography and reality meet and whether technology is elevating photography as an art form. Though the exhibition seems to suggest that advanced technology can produce great artwork, the answer is ultimately in the eye of the beholder.